Lamb. Delicious, right? How about some Lung Puffs for a treat? You aren't too sure about that one, are you? 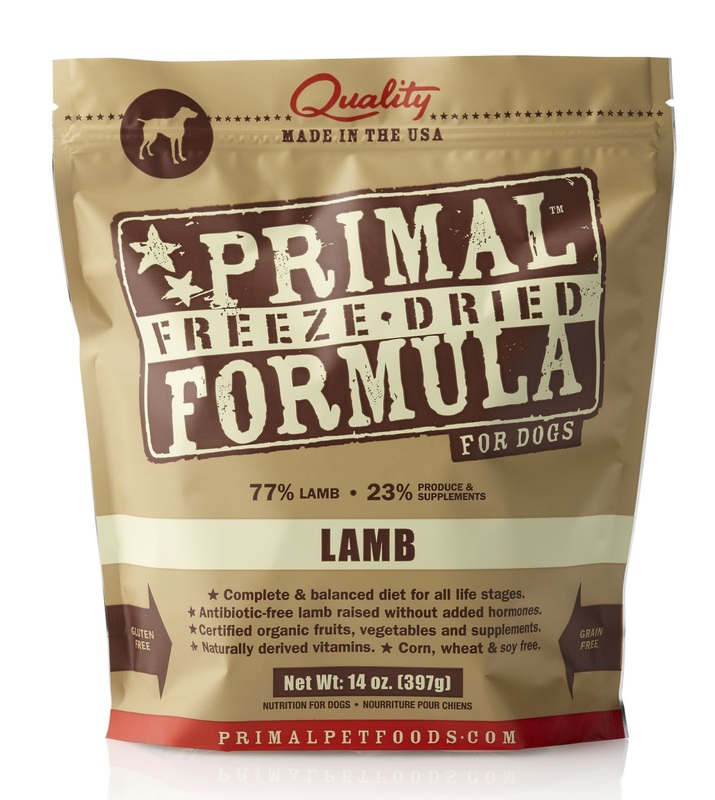 As you know, I am part of the Primal Pet Foods Product Review Program and after Ma clarified that I was allergic to poultry, the kind folks at Primal sent me some Freeze-Dried Lamb Formula and some Venison Lung Puffs treats. 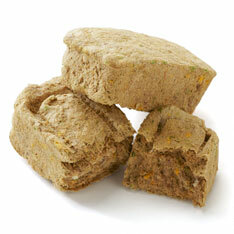 I know to humans these may not sound appetizing but rest assured, dogs will LOVE them! Lamb Hearts, Lamb Livers, Ground Lamb Bones, Organic Kale, Organic Carrots, Organic Yams, Organic Broccoli, Organic Apples, Cranberries, Blueberries, Organic Pumpkin Seeds, Organic Sunflower Seeds, Minerals (Zinc Sulfate, Copper Carbonate, Sodium Selenite), Organic Parsley, Organic Apple Cider Vinegar, Salmon Oil, Organic Coconut Oil, Organic Quinoa Sprout Powder, Dried Organic Kelp, Alfalfa, Natural Vitamin E, and Mixed Tocopherols (natural preservative). 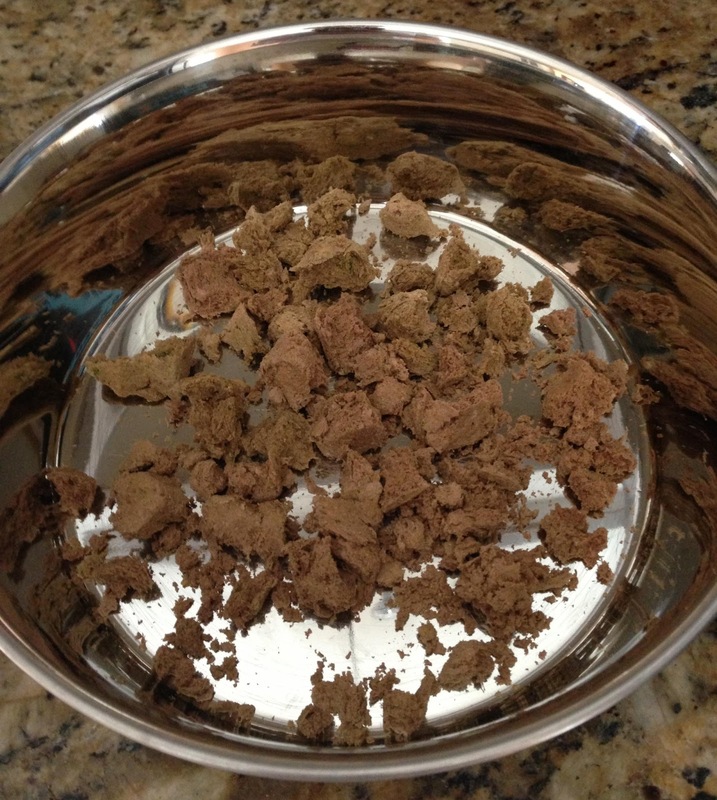 As with all the freeze-dried formulas, you just break up the nuggets, add some water and then it is ready to eat. Ma had been purchasing the Freeze-Dried Duck formula so the Lamb was a nice change. We did notice that the Freeze-Dried Lamb Formula nuggets were a bit harder to break up than the Duck, but we just assume it is because it is a different kind of meat. 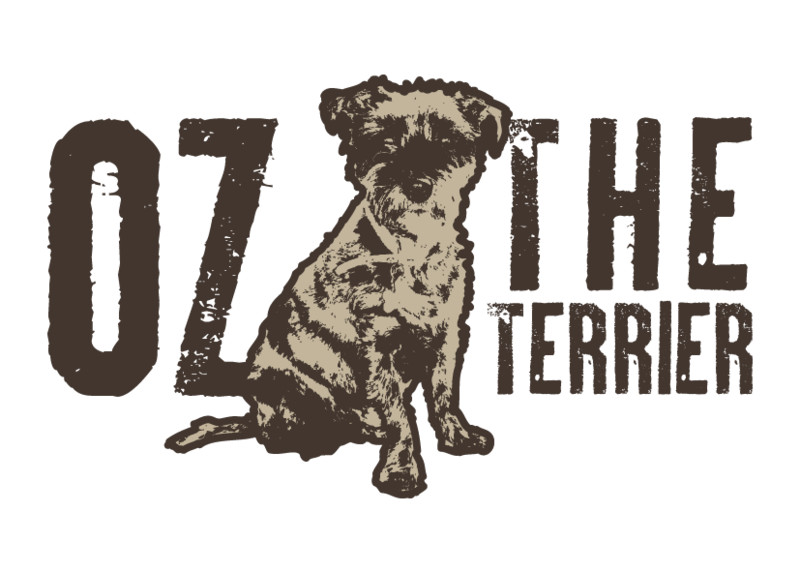 Primal Pet Foods gets their venison from New Zealand, where the venison is raised without any antibiotics or added hormones. When they dry roast the lung pieces, Primal adds no preservatives, salt or sugar. Basically, these are straight up lung pieces and they look every bit as you think they would look (the weak may want to avert their eyes). 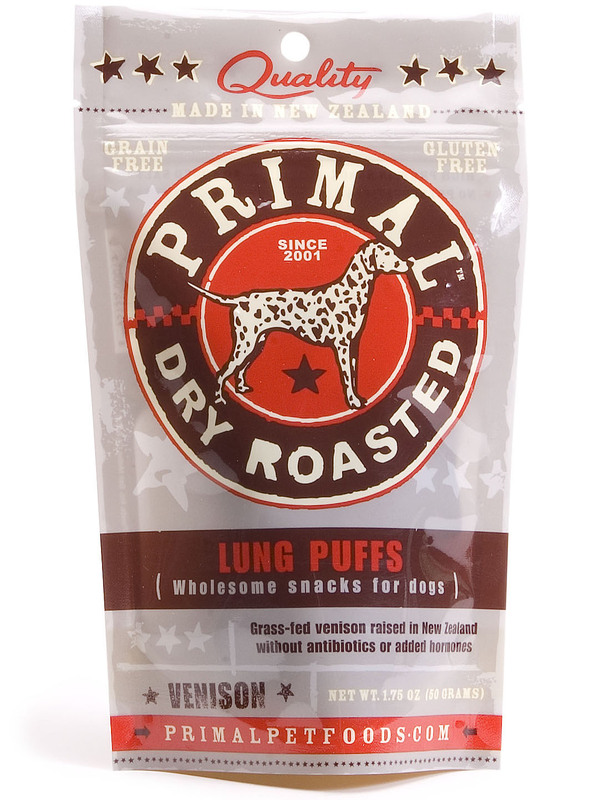 The Primal Pet Foods Venison Lung Puffs contain some great minerals including Calcium, Copper, Iron, Magnesium, Maganese, Phosphorous, Potassium, Sodium and Zinc. I have enjoyed these treats...a lot! 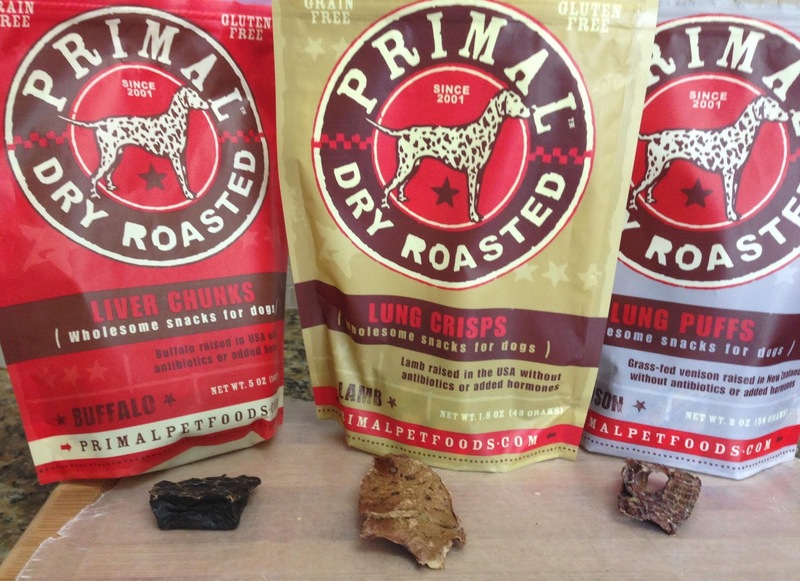 Since I had been enjoying the Venison Lung Puffs, Ma went shopping and got me two other types of Primal Pet Foods treats to try - Dry Roasted Buffalo Liver Chunks and Dry Roasted Lamb Lung Crisps. I love them all...but can you guess which is my favorite of the three? You know you want to try some of these!! Ma says I have expensive taste because my favorite of the three treats are the Dry Roasted Buffalo Liver Chunks (and according to Ma, they cost the most of all the treats). 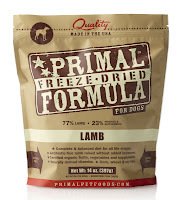 So, how do the Freeze-Dried Lamb Formula and Dry Roasted Venison Lung Puffs rate? 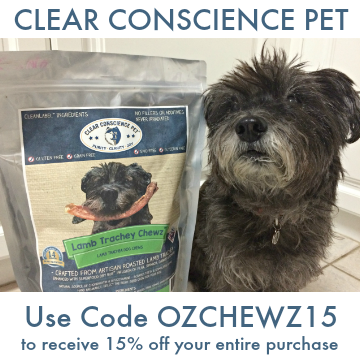 I give them 4 out of 4 dog bones because they are delicious and healthy! 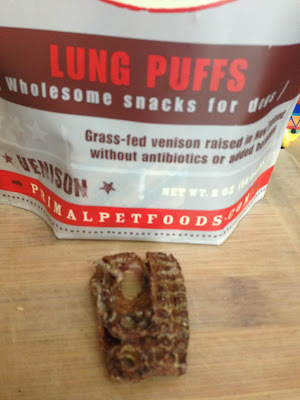 Thank you Primal Pet Foods for allowing me to try the Freeze-Dried Lamb Formula and the Dry Roasted Venison Lung Puffs. I have added them into my diet since variety is key when eating raw! 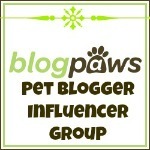 Review Disclaimer: I am a member of the Primal Pet Foods Product Review Program. I did not receive any monetary compensation for this review. I was given a free product to review. The opinions in this review are my own and not influenced by any outsider. I receive no additional benefits for talking about the product or company. Interesting! Never heard of them and I don't think I've seen them in my store either. Might have to ask them. Thanks for sharing! They are delicious, Bren! You should see about getting your paws on some. Seriously - the two things we can actually eat - lamb and venison - we will be looking for these! OMD! 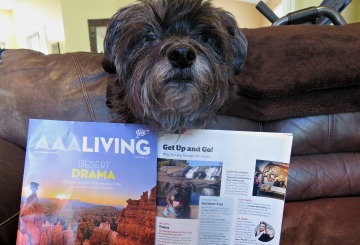 You will love them, pals!! 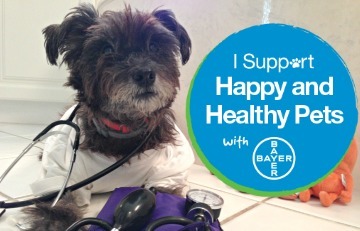 Anything to keep them happy and healthy! Thanks for the recommendation. Ma agrees with you, Kimberly...they do NOT look appetizing to humans (I say, more for me then!). However, I think they are all delicious and nothing is added to them...just dry roasted organ pieces. You should give them a try! Oh Ku...you would love them. BOL Then you should try them Mollie. I bet you would love them! Yummy! We love that stuff! 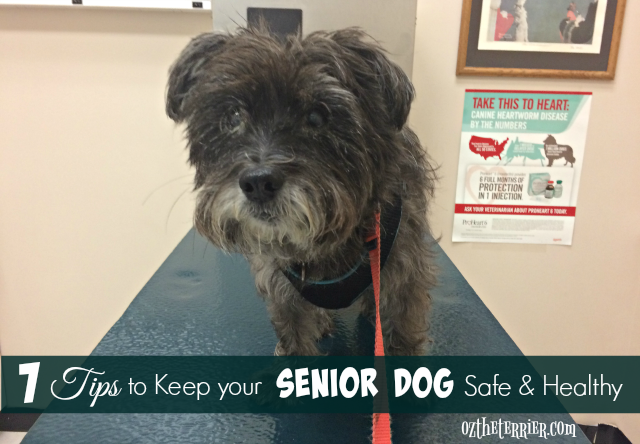 I have a bag of lamb lungs in my treat drawer now as a matter of fact! Some humans find it disgusting but it is great for us pups! Pawesome, Emma! I love them and so glad I know another pal who eats them too! Looks well yummy. Enjoy Oz. Have a marvellous Monday and stay cool. They are yummy, Molly. Really! I can see why dogs would love those. And what a great healthy treat. They are super yummy, Roxy! Oooh, lamb lungs are good too! Them treats sound great and healthy. Oh Sheba, they are so delicious. They look good to us! I will definitely have to try some, thought I was going to try some this week, but discovered I bought CAT primal and not dog... guess the kitties are going to get a few good meals!! Oh dear dog...Cat Primal instead of Dog...that's almost as bad as daddy-dog seeing "sardines" on the package and buying it for me when it has poultry in it (and I'm allergic to poultry). Humans! What a great review! Have a great day and enjoy your treats. Thanks for the super review! Very interesting! Mom has been looking into this food. Oh that is great to hear! I hope she finds some for you to try! 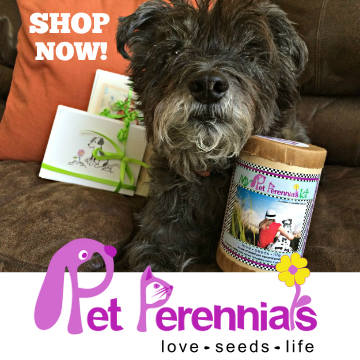 they have a store locator on their website if you need help finding a store near you that sells it! They look a bit grim, but they sound delish! Yes, Ma would agree with you that they look grim but I swear they are tasty! Lamb Lung Puffs are amazing! Price wise, you might want to look at Jones lung puffs. Is there a store near you which sells Jones? Oh Miss Flea...I do not know! I've never seen Jones stuff before...but who knows. Is there a store locator somewhere that I could use? I find this all pretty awesome! Well that looks super super tasty!!!!! All that first ingredient lamb, can't complain about that! Great review! Oh nomm! #1 is ordering right now! 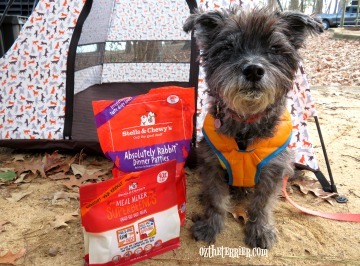 We have lots of doggie pals, and we bet they would LOVE those yummy treats!